The Local Good featured in Vue Weekly! We made it! We’re in the news! Check out today’s edition on Vue Weekly to see this fantastic article on The Local Good and our 5th Anniversary Party! Big thanks to Meaghan Baxter for taking the time to get to know TLG and spread the word! Read on, get your tickets and celebrate Edmonton’s renaissance on December 5th! There are times, for example, when it hits -30 C before factoring in the windchill, when it can be difficult to love Edmonton, but beyond its perceived flaws is a multitude of opportunity, diversity and a boom of activity that The Local Good is working to connect the population to. 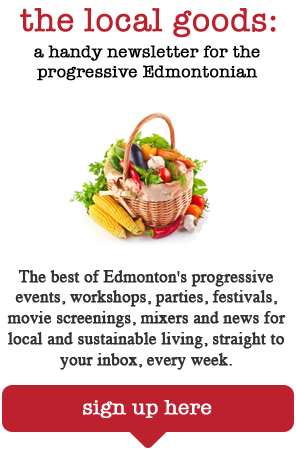 The not-for-profit organization—formerly known as Edmontonians Supporting a Green Economy (E-SAGE)—started five years ago by a group of Edmontonians who were passionate about living local, sustainable, progressive lifestyles, but didn’t have a platform to share information and connect like-minded individuals who were interested in local food, farmer’s markets, making socially responsible choices and all around making Edmonton an exciting city to live in.